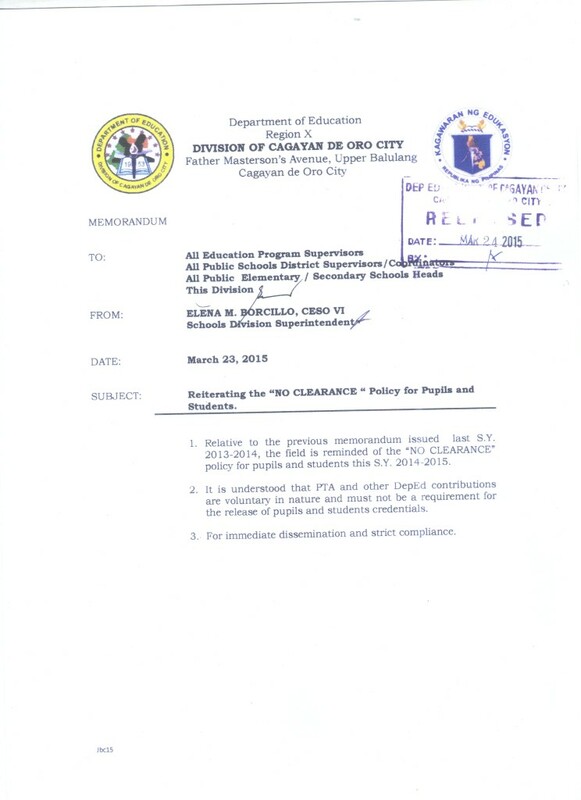 “No Clearance” Policy for Learners and Teachers Every End of School Year, Deped Reiterates. It has been a long practice in schools that teachers are being required to submit clearance at the end of every school year. In case of loss of books by pupils/students, DepEd Order No. 25, s. 2003 entitled “Resolving Losses of Textbooks” provides the guidelines for issuance of clearance by the School Property Custodian upon submission of all the required documents in the application for relief from accountability. In this connection, schools are reminded to adhere thereto. teachers, for their information, with proof of individual receipt by them. In case of failure to comply, a reminder may be issued by the School Head citing this Memorandum and the school memorandum issued. Willful failure to comply may be acted upon administratively pursuant to the DepEd Rules of Procedure.